Pope Francis lands to cheers in US Jump to media player President Obama and his Family have greeted Pope Francis upon his arrival at Joint Base Andrews in Maryland. Gay Catholics' message to Pope Francis Jump to media player Ahead of Pope Francis' visit to the US, gay Catholics tell the BBC what they want to hear from the Pontiff. Philadelphia prepares for the Pope Jump to media player The final leg of Pope Francis' US tour is Philadelphia. It's being billed as one of the largest events in the City of Brotherly Love in modern times, and could attract up to a million and half people. 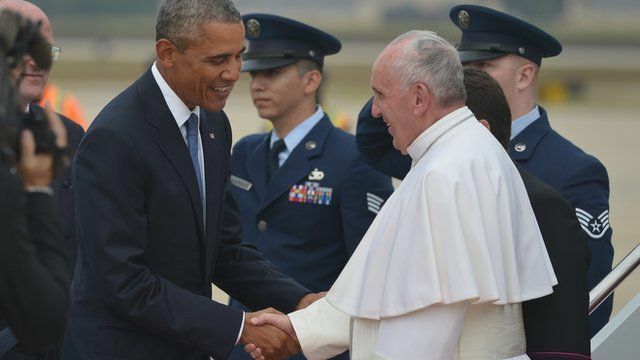 Pope Francis arrived in the Washington, DC area from Cuba on Tuesday afternoon and was greeted by President Obama and his family when he got off the papal plane. He is expected to greet millions of America Catholics and address thorny issues like climate change and income inequality.